The following bio was found on the poet's website: http://www.writingonthefarm.com/. Julia Shipley is an independent journalist and author of The Academy of Hay, winner of the 2014 Melissa Lanitis Gregory Poetry Prize and Adam's Mark, named a Best Book of 2014 by the The Boston Globe. Winner of the 2006 Ralph Nading Hill Award and two-time recipient of Vermont Arts Council and the Vermont Community Fund grants, she was also awarded The Frost Place's Grace Paley Poetry Fellowship, as well as fellowships to The Center for Book Arts and The Studios at Key West. Her poems and essays have appeared in CutBank, Colorado Review, December, FIELD, Fourth Genre, Gettysburg Review, Green Mountains Review, North American Review, Orion Magazine, Poetry, Poet Lore, The Rumpus, Taproot, The Toast, Verse Daily and elsewhere. She holds an MFA from The Bennington College Writing Seminars and lives in Vermont's Northeast Kingdom. A native of southeastern Pennsylvania, she earned her undergraduate degree in Environmental Education traveling throughout the western regions of United States with the Audubon Expedition Institute. Throughout her twenties she worked on organic farms in the Northeast operating as CSAs (Community Supported Agriculture), and for the last decade she's tended the soil on her homestead in Vermont. Hence her work is often obsessively concerned with place, the fate of landscapes, agrarian ideals, and stories that track things from germination through their harvest and beyond. The former Director of Writing Studies at Sterling College, she's a contributing editor to Yankee Magazine and contributing writer for Seven Days: Vermont's Independent Weekly. She has also written for BELT, American Forests, Burlington Free Press, Northern Woodlands, Stowe Guide, The Magazine, and Vermont Life among others. A portfolio of her journalism is here. Interviews with Julia and episodes exploring her thoughts on craft are included in: Whole Terrain and this joy + ride and North American Review. I've never met Julia Shipley. On what she described as "one of those browsing benders," she happened on The Kentucky Review, where she read one of my poems, and in my bio found my writer's website through which she found more of my poetry, and eventually contacted me. In her email she talked about the whole point of writing being "to connect," and that since my poem spoke to her, hers might speak to me. And indeed, her poems I found online did speak to me, so I agreed to her sending me a copy of her upcoming poetry collection, The Academy of Hay, for a possible review. 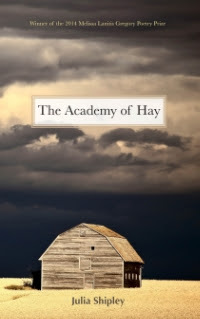 The poems in Julia Shipley's The Academy of Hay speak of cycles, transitions, connection, and duality with repeated imagery of light and dark, tenderness and violence, growth and destruction/disintegration, life and death experienced in daily life on a farm amid crops and farm animals. Her poems are infused with a passion for paying attention and an emotional core of wonder, reverence, and longing. she grins back from the polished steel. An additional layer of meaning I saw in this poem was the idea of the poet creating—assembling poems and polishing them into being—the push and pull of the writing process. The shift from the past tense to the future tense of "I will fit" effectively creates a tension in the poem, along with the haunting image of the earth as "urn" suggesting a death and a funeral urn. Which leads perfectly into the next poem, a prose poem titled "Ballistics" where the speaker discovers a bullet on her driveway, which leads to musing (seemingly playful, but dead serious) about the motion of projectiles, hunting (accidental and intentional deaths), innocence and guilt, and a first sexual experience. the farmer showed up, hacksaw in hand. She keeps this stub to remind her. This poem's ending image of keeping the stub is a haunting one, suggesting not only the vulnerability of this ram, but the precariousness of all life, and the responsibilities involved in caring for "The Herd," as this first section of poems is titled. The phrase "brink of blindness" also implies how quickly things can change—another major idea expressed in the poems. The following poem, "The Day We Woke Up With and the Day It is Now," speaks of transitions and flow, how one sheep during the night nudged a gate open and all the others followed into the garden, where they "graze on tender lettuce, bean shoots, coils of peas." This phrase is just one example of the beautiful images and sounds Shipley creates with her word choice. The poem begins in darkness and transitions into day at the end: "while the mountains settle out of the plum sky / I'll follow all day." This ending is not only pleasing in the visual image it describes of the mountains slowly coming into view, separating from the plum color of the sky, but in the soothing, dreamy sounds of the repeated l's. This poem is full of delightful repeated sounds and internal rhymes such as "turn to lure," "nightgown and muck boots," and "rubber bucket" that bring the poem alive in the reader's senses. I've wanted you to open like a ribbon with a slipknot. Again the above lines create visual beauty as well as beauty of song with the repeated sounds of "week I watched," "milkweed leak," "soft exhaust" and "fine hairs climb," creating a lush, languid mood. And by addressing a "you" in the poem, she creates a sense of intimacy that pulls the reader deeper into the poem's experience—something she repeats in other poems. the wings of living moths out of wet paint. with little caves, their stones all rolled aside. keeps the boat at a halt, despite their heart. position and relax its length against the earth. the drill has persuaded the wood to open. There's a sense of tenderness and yet violence in these lines, and I couldn't help but get the image of some other acts of violence the speaker might be imagining as she does the necessary work, creating a tension that vibrates through the poem. This tension continues in the poem "The Letdown," where "He keeps a herd / of words inside— / they mill around / like cows in a free-stall / barn at night, / their full udders ache." What a stunning image of the weight of that milk aching like the weight of unsaid words. keep from blowing crawling falling growing away. The theme of duality emerges again in the prose poem "Winter as a Profit and Loss Statement," where the speaker muses over what changes the winter will exact, with haunting, violent images such as "The chicken's struggle written in wing marks and scarlet / beside the dog prints stabbed in the snow" and "The cow's / bloated body is hard as a brick at the back of the barn." Alongside these stark images are tender ones: "Her finger traces the valley of his back" and "Snowflakes stick singly and doubly to a cow's roan coat." At the poem's center are the intriguing lines that speak of relationships: "She's felt a man go away without moving a muscle. She's seen a man veer away from a woman and he didn't move at all." make spice a kind of grace. The near rhyme of "spice" and "grace" at the poem's end adds emphasis to the tenderness of the image, as the repeated sound of "ruptured" and "scuffed underfoot" in contrast adds to the violence of the visual image, again repeating the idea of life's duality. These last three lines echo the idea of duality, in that the sweetness of the honeysuckle satisfies and yet at the same time makes her crave more. In the book's last section, "The Herd of the World," the poem "Sufficiency, September 11, 2006" continues with the idea of life's duality— life and death, violence and tenderness. On the anniversary of so many deaths, the speaker is "holding their takeover tool," (a knife) to harvest lettuce, which she describes herself "sweeping / its edge through the slender necks of lettuce, / placing each head in the box you are dragging / along as the minutes go by quietly 8:45, 9:03, 9:59, 10:28..." She ends the poem with the haunting lines, "the lettuce stalk weeps a milk sap / on both ends—the part still rooted and the part freed; / dawn cruises into noon, you have everything you need." The lines "little grain of me or star, / more silica than cell, you sort of something" have a whimsical tone, but the last two lines suggest the speaker's decline and eventual death in the image created by "your / fall toward loam," reminding us that we humans are indeed all on our way to dying. The playfulness of the chick as asterisk and head as apostrophe effectively contrasts the images of violence that she performs as part of farm work. The prose poem "Gloves" is a type of meditation on the work hands do: "tucking" seed potatoes "in the earth," then months later twisting "the numerous doorknob tubers loose." She lovingly describes catching and freeing a bird her cat caught and let loose in the house: "I recapture it, closing my fingers around the bulb of blue feathers, absorbing its scampering pulse. Releasing it to the cherry tree in the yard, then my hands seem hollow." The poem ends with the beautiful image of her hands as "unsheathed instruments whose sowing and reaping, seemed from a distance, seemed like the act / of stooping to shake hands with the earth." Reading Julia Shipley's poems in The Academy of Hay drew me into the partnership of a person to the land and farm animals she tends, and how these connections relate to partnerships with people and the life we share as humans. Her lyrical, evocative poems strike a perfect balance between light and darkness; they resonate with tenderness, yearning, gravity and grace. Karen George retired from computer programming to write full-time. She lives in Florence, Kentucky, and enjoys traveling to historic river towns, mountains, and Europe. She is author of Into the Heartland (Finishing Line Press, 2011), Inner Passage (Red Bird Chapbooks, 2014), Swim Your Way Back (Dos Madres Press, 2014), The Seed of Me (Finishing Line Press, 2015), and The Fire Circle (Blue Lyra Press, 2016). You can find her work in Naugatuck River Review, Heron Tree , Louisville Review, Wind, Permafrost, and Still. She holds an MFA from Spalding University, and is co-founder and fiction editor of the journal, Waypoints. Visit her website: http://karenlgeorge.snack.ws/.